Are you not comfortable leaving your car exposed to the elements? Please let us know in advace and arange parking with one of our taxi drivers. 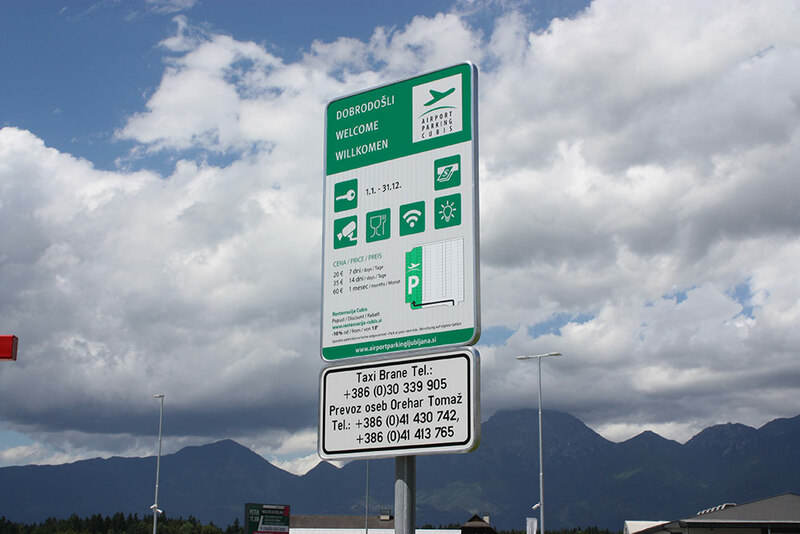 The AIRPORT PARKING CUBIS is located in the direct vicinity of the A2 highway (Ljubljana – Karavanke tunnel) on the No. 9 exit (Kranj-vzhod). 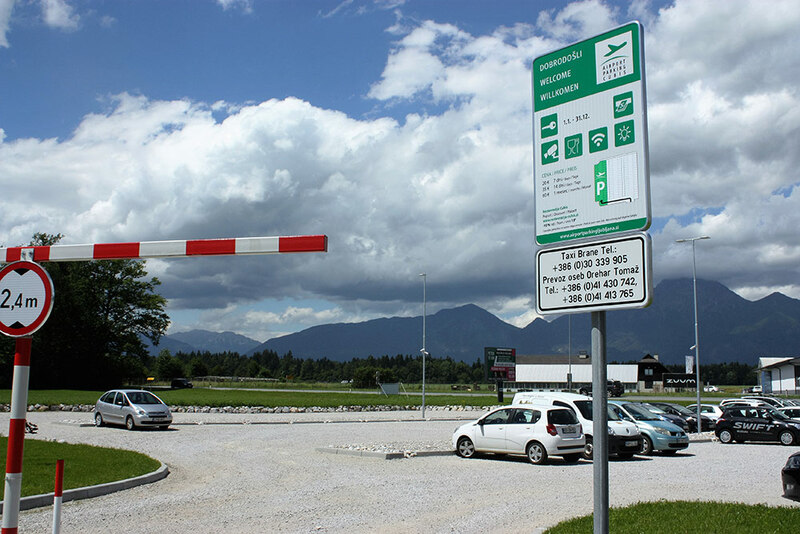 Driving from Austria the parking is located 1,2 km from the highway exit, driving from Ljubljana the parking is located 400 m from the highway exit in the direction towards the Ljubljana International Airport. 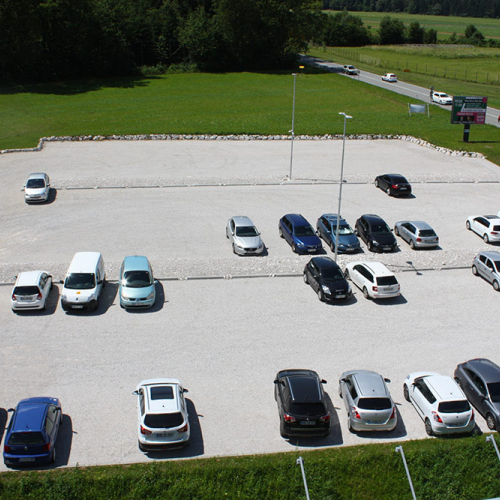 Cheap and safe parking near the Ljubljana International Airport either on the outside parking or in the garage. Travel carefree – use AIRPORT PARKING CUBIS, where you can park long-term for an affordable price and without an advance notice. We offer you an illuminated parking area, equipped with a video surveillance system, periodic security rounds, automated payment machine and free internet. Upon advance notice there is also a possibility to park in the garage (reservations at info@r-p.si). You can order transport from the parking to the airport (approx. 5 minutes – 3.5 km) with one of our partner companies: Taxi Brane (phone. : +386 (0)30 339 905) or Taxi Savić Vaskrsija s.p. (Tel. : 00 386 (0)41 245 781)/strong>. Please call them at least half an hour befor your arrival. The price of the one-way transport to the airport is 10 €. 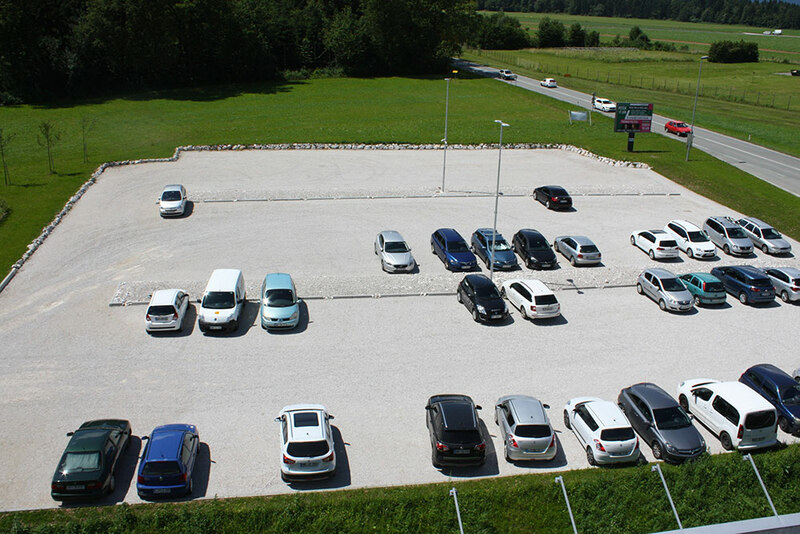 AIRPORT PARKING CUBIS is distanced 3,5 km from Airport Ljubljana – Letališče Jožeta Pučnika. For transfer from parking to the aiporot you will need approx. 5 min. The CUBIS Restaurant, situated 150 m from the camper stop, is renowned for its excellent food, from delicious steaks and spare ribs to burgers, including a popular gluten-free burger. It also offers a choice of fish, pasta and many other dishes. The restaurant is TripAdvisor's first choice for the Šenčur area. Show your parking receipt and get a 10% discount on the a la carte menu. A UniCredit Bank ATM is available 24/7 for basic banking services for BA Maestro, MasterCard and VISA card holders. UniCredit Group bank account holders can withdraw cash and check their balances free of charge at 20,000 ATMs in 17 countries, including Hypovereinsbank in Germany, Bank Austria in Austria and Zagrebačka banka in Croatia. Pečjak's traditionally baked goods are distinguished by their constantly delicous taste and superior quality. Pečjak only uses natural ingredients. Their products are particularly famous in Slovenia and beyond for their ample filling. Guchek Premium Hair Salon is the perfect choice for people looking for something more. An experienced stylist will ensure that you look exactly the way you want at your first appointment, and beyond.